Christmas Snowflake Ladies spaghetti shoulder straps, wrap-around stretch smocked mid-section, tie halter style, go strapless, Long sundress is available in Black and Beige. Please use "Style 151O Smocked tube Top Size Chart"
(4) Order the next size up if you have large breasts. 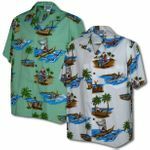 RJC Brand - Shannon Marie Label maker's of Men's, Boy's, Women's and Girl's Matching Hawaiian Christmas Aloha Clothing since 1953. There are no universal size standards in the apparel business. One manufacturer’s large is another manufacturer’s medium, etc. These measurements, shown in inches, on this size chart, pertain to R. J. Clancey Smocked Long Sun Dresses, and have no relationship to any other dress maker or brand name. BUST -Bust  Circumference measurement taken across the middle of the smocked portion of the dress. * The first measurement is a minimum measurement taken as the dress lays flat. The second measurement is the maximum stretched measurement. HIP - Maximum circumference; mid-skirt of the dress. LENGTH - Taken from top, smocked portion of dress to the bottom hem.